Connect to XFINITY cable internet and boost your wired data transfer speeds with the Nighthawk CM1150V Multi-Gig Cable Modem for XFINITY Voice from Netgear. Compatible with the DOCSIS 3.1 standard and made for XFINITY Voice customers, the Nighthawk CM1150V is capable of download speeds up to 10 Gb/s and upload speeds up to 1 Gb/s. The CM1150V comes equipped with four Gigabit Ethernet LAN ports. You can aggregate two of those LAN ports to double your maximum wired speeds if you have a compatible router. The modem also comes with two RJ11 telephone ports and supports calling features such as three-way conference calling, caller ID, and call forwarding. Up to 10x faster than the DOCSIS 3.0 standard, DOCSIS 3.1 supports up to 10 Gb/s download and 1 Gb/s upload speeds. Since the technology is backward compatible, upgrading to a DOCSIS 3.1 modem means you can still use your current internet service and be ready for the faster speeds if your service provider upgrades to DOCSIS 3.1. Use an Ethernet cable to connect the CM1150V cable modem Ethernet ports to the WAN port of your existing Wi-Fi router. When used with a compatible Wi-Fi router like the Nighthawk AX8, you can aggregate two of the modem's LAN ports to double maximum wired speeds. It is compatible with most internet speed tiers with voice plans. Built for XFINITY from Comcast, the modem boasts two integrated telephone lines and supports enhanced calling features such as 3-way conferencing, caller ID, call forwarding, and more, making it an ideal choice for a home office. XFINITY customers can get connected without a service call. 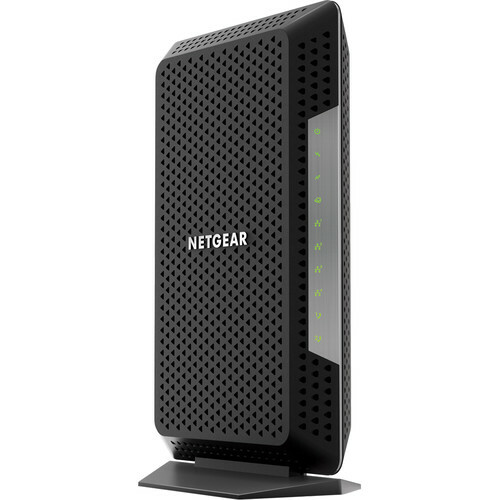 By buying a modem rather than renting one from your internet service provider, you can save up to $156 a year. The C1150V's telephone ports automatically prioritize voice over internet for optimal call clarity. Box Dimensions (LxWxH) 15.3 x 9.7 x 4.2"